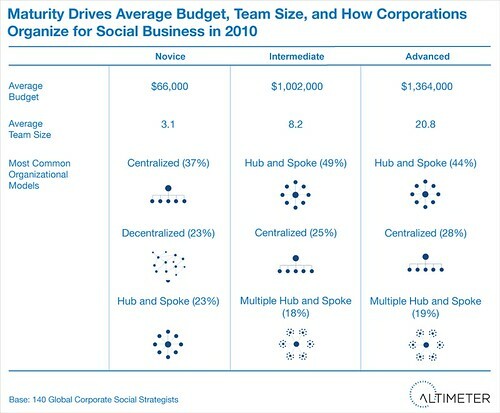 If you haven’t read our report on How Corporations Should Spend on Social Business, start there. This data is a segment of the research panel over 140 global national corporations with over 1000 employees, which we deem enterprise class corporations. We segment corporations into a variety of maturity phases to indicate how advanced they are, although there are more gradients we can apply, we’re focused on three major segments at this time ranging from novice, intermediate to advanced, we found that there’s a natural bell curve with the intermediate accounting for about half, and about a quarter that are novice as well as advanced. 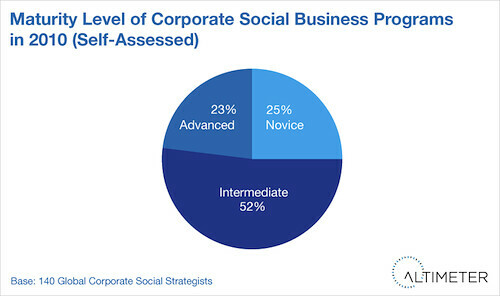 In the following data cut, we’ll explore how companies that self-identified as advanced are investing in social business. Companies like Dell, Comcast, Wal-Mart, Adobe, HP, Microsoft, Wells Fargo, Ford, have characteristics of advanced corporations. What makes them advanced? They have formalized programs and charter, dedicated teams, line item budgets, and have likely been deploying for over 2.5 years. In my experience, a great deal of this market is likely to be the early adopter technology space (B2B first, followed by B2C) then retail/cpg, hospitality, and financial services. Spend More on Staffing –But Underfund Training Them. These advanced corporations are spending 68% more on their staff to manage (headcount) than the average company. As a result, they have more feet on the ground to manage and respond to these programs. 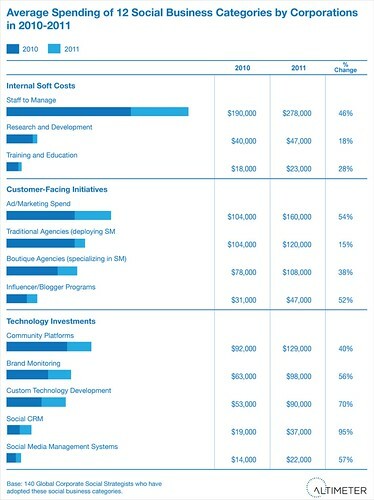 We know that social business is drastically impacted by the talent hired (a lot of soft costs) so no surprise these companies are outspending the average company on teams. 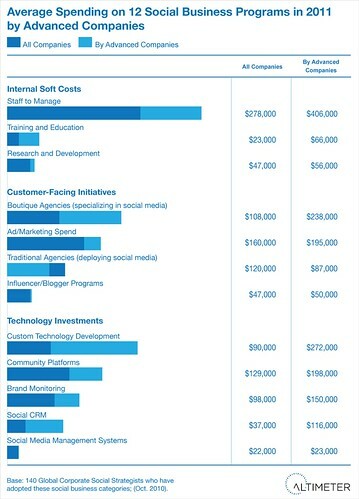 With that said, $406k per year isn’t a large team (pending on location) but given that we’re only 2.5 years into social business, this is early. Sadly, these advanced companies spend very little on training and education, nor research and development. As a result, expect the social business team to be experimenting, self-learning, or relying on peers at other companies to glean knowledge. Rely Heavily on Boutique Social Media Agencies –Not Traditional Agencies. In customer-facing programs, we see a large spend on specialized boutique agencies who may focus on longer term engagements, rather than their counterparts the traditional campaign focused digital agencies. If you want to know more, read this analysis on boutique agencies overtaking traditional agencies and the many comments. Secondly, there’s an increased spend on advertising on social networks, although it’s assumed that traditional agencies are likely to absorb some of that spend to support campaign initiatives. In both cases, influencer programs remain about flat in spending, likely due to these advocacy programs being scalable and a limited number of influencers available in each market. Custom Tailor Their Efforts, Relying on Mainstay Community and Brand Monitoring. The social web is a fragmented disparate network of different data types, apis, and a myriad of fly-by-night startups. As a result, the corporations must constantly glue together these solutions to develop a common experience, which explains over $272,000 spending on custom work. Naturally, these may feed into the spending of the boutiques who will be leading this charge externally, coupled with internal web development and data teams. Secondly, the mainstay of social programs are community platforms with an annual average spend of about $200k and $150k spending on listening tools like brand monitoring. Expect that these tools will be cascaded to multiple business units, product sets, and spread across the enterprise, hence the larger spend. Not well understood or known by mainstream companies, SCRM remains a lower line item for average companies, but respectively balloons for advanced companies that are funneling customer social data into CRM databases to glean intelligence, reporting, and predictive analytics. The one year old Social Media Management System space has minute revenues, but expect six figure annual spending within years. 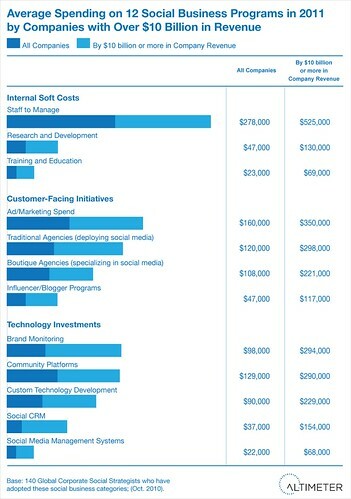 How do the biggest and most successful corporations spend on social business? We aimed to find out. These “wealthy” (which deemed by annual revenues) corporations spend comparatively more on customer facing social business efforts than most other corporations, yet the overall subtotal of spending is significantly small. 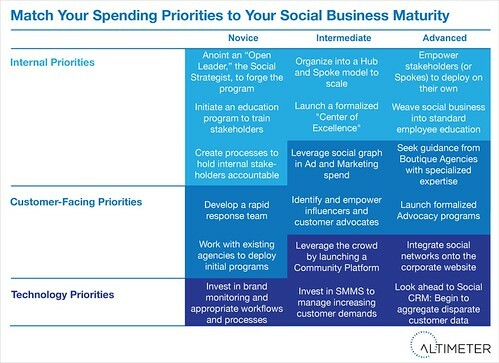 First, recognize that social business has only been formalized in programs for about two and a half years (data), and most companies are intermediate but not advanced. The following data is of companies with over $10 billion dollars in revenues per year, and their expected spend as reported by the Corporate Social Strategist. This data is a cut from our recent reports on Social Business Spending, and clients can receive additional data from us as needed. Across nearly all efforts, the wealthy (deemed by revenues) spend over double than the average corporation in social business. 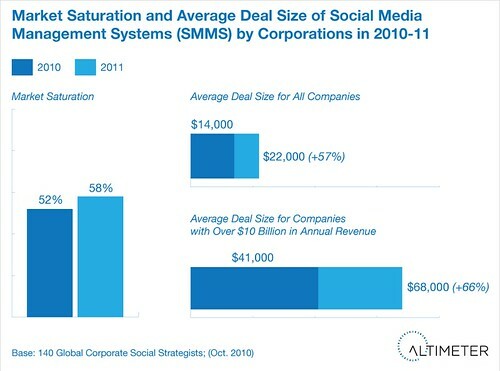 This is in alignment with Altimeter’s Engagement DB study which shows a strong correlation (not causation) between how corporations are engaged with their customers and the size of company. These corporations spend significantly more on internal staff to manage, more than any other program, which is in line with this labor intensive program to get internal teams organized as well as to manage communities, blogs, advocacy programs. Sadly, the training and education programs to train this staff and line of business is incredibly low, under $70,000. Secondly, there’s a significant spend on advertising, which is often deemed a scalable marketing effort as you can just ‘throw dollars’ at it and hope to get a conversion return –without having to engage with customers in costly dialog. These wealthy corporations are spending slightly more on traditional agencies, yet social media boutiques are still grabbing a lion’s share over $221k per year and growing. To learn more how boutiques are evolving over traditional, read this data. In the software category, there’s continued spend on recurring SaaS providers like Brand Monitoring, Community Platforms (both nearly achieving 300k annual spending), and then programs to integrate and customize this content.